Deciding what to buy with some extra money. Selecting a deductibleThe amount that you pay before the insurer starts reimbursing you either in part (see coinsurance) or in full. Deductibles can apply per claim (as is usually the case for auto collision and homeowners... More for your homeowners insurance. Choosing to invest in a bondA form of debt issued by government entities and corporations. fund, an S&P 500 index fundA type of exchanged-traded fund (ETF) or mutual fund that invests in such a way that the returns on the fund are identical or very close to a market index. For example, an S&P 500 index fund wou... More or the stock of a single company. I’ll use Apple as the example for the single company. Almost all financial decisions involve some sort of a trade-off. In last week’s post, I used statistical metrics (e.g., standard deviationA standard deviation is a (slightly messy) statistical calculation that results in a positive number that measures how much the possible results differ from the average result. For those of you who ... More, probabilities and percentiles) to define riskThe possibility that something bad will happen.. Many financially savvy people use those types of metrics. To get you more comfortable with the idea of this type of trade-off, I’ll use a subjective measure for the first example – deciding what to buy with some extra money. I’ll then use statistical measures for the other two examples. Let’s assume your grandparents or parents gave you $1,000 for some special occasion, such as a graduation, birthday, or marriage. You have decided to spend the money in one of the following ways. Spend $1,000 on a ski weekend. Spend $500 on a new Xbox and some games. Spend $1,000 on the latest iPhone. Don’t spend any of it. • Traditional - No taxes are paid on the contributions or any changes in the market value of the investments ... More) or Tax-Free Savings AccountA type of Defined Contribution Plan available in Canada. Contributions are made with after-tax dollars, but no taxes are paid on any changes in the market value of the investments in the account or wh... More (TFSAA type of Defined Contribution Plan available in Canada. Contributions are made with after-tax dollars, but no taxes are paid on any changes in the market value of the investments in the account or wh... More). • Traditional - No taxes are paid on the contributions or any changes in the market value of the investments ... More or TFSAA type of Defined Contribution Plan available in Canada. Contributions are made with after-tax dollars, but no taxes are paid on any changes in the market value of the investments in the account or wh... More, knowing that it will lead to an enjoyable retirement, as part of how much you will enjoy the options that include a contribution. Your first inclination might be to select the iPhone because it will give you the most enjoyment. However, that doesn’t take into account the fact that it costs more than the Xbox and clothes. Clearly, though, you prefer the iPhone to the ski weekend because you get more enjoyment for the same cost. I always find it much easier to understand data in a graph than in a table. The graph below shows the data above. The x-axis (the horizontal one) represents the reduction in how much money you have after buying each item. That is, it is the negative of the cost of each purchase. The y-axis (the vertical one) shows how much you like each item. In this graph, you prefer things that are either up (higher ranking) or to the right (less cost). The graph above is called a scatter plot. In theory, there are dozens of things that you could buy, such as is shown in the graph below. There are no other purchases with the same cost that you enjoy more. There are no other purchases with the same level of enjoyment that cost less. The “best” choices are those that fall along the efficient frontierWhen evaluating different options, the set of points for which there are no other options that either have a higher return for the same amount of risk or less risk for the same return.. You can reject any choices that aren’t on the efficient frontierWhen evaluating different options, the set of points for which there are no other options that either have a higher return for the same amount of risk or less risk for the same return. as being less than optimal. Going back to the first example, I added an approximation of the location of the efficient frontierWhen evaluating different options, the set of points for which there are no other options that either have a higher return for the same amount of risk or less risk for the same return. based on the five points on the graph. From this graph, we can see that any of buying the iPhone, buying the Xbox and some games or buying nothing are “optimal” decisions because they are on the efficient frontierWhen evaluating different options, the set of points for which there are no other options that either have a higher return for the same amount of risk or less risk for the same return.. That is, while the ski weekend has the same cost as the iPhone, you rated it as providing less enjoyment so the ski weekend is not optimal. The clothes option is both more expensive and provides less enjoyment than the Xbox option, so it is also not optimal. In this example, I have used the change in your financial position as the measure of “riskThe possibility that something bad will happen.” and your level of enjoyment as the measure of “reward.” Your own evaluation of the trade-off between riskThe possibility that something bad will happen. and reward will determine which of the options you choose from the ones on the efficient frontierWhen evaluating different options, the set of points for which there are no other options that either have a higher return for the same amount of risk or less risk for the same return.. This example was intentionally simplistic to introduce the concepts. I will now apply these concepts to two more traditional financial decisions – the choice of deductible on your homeowners (or condo-owners or renters) insurance policy and your first investment choice. My post about whether Chris should pay off his mortgage provides an even more complicated example. In this example, you are deciding which insurer and what deductible to select on your homeowners insurance. For this illustration, I have assumed that your house is insured for $250,000 and you have a $500,000 limit of liability. You have gotten quotes from two insurers for deductibles of $500, $1,000 and $5,000. As discussed in my post on Homeowners insurance, the deductibleThe amount that you pay before the insurer starts reimbursing you either in part (see coinsurance) or in full. Deductibles can apply per claim (as is usually the case for auto collision and homeowners... More applies to only the property damage coverage and not liabilityWhen used as a noun, the amount you owe to someone else. When used as an adjective, an insurance coverage that protects you when you cause damage or injury to someone else or their property..
For reward, I will use the average net cost of your coverage. That is, I will take the average amount of losses paid by the insurer and subtract the premium. Because the insurer has expenses and a profit margin, this quantity will be a negative number. Larger values (i.e., those that are less negative) are better (less cost to you). For riskThe possibility that something bad will happen., I will use the total cost to you if your home has a loss of more than $5,000. Your total cost is zero minus the sum of your deductibleThe amount that you pay before the insurer starts reimbursing you either in part (see coinsurance) or in full. Deductibles can apply per claim (as is usually the case for auto collision and homeowners... More and your premium. This number is negative (because outflows reduce your financial position) and larger (less negative) values are better. The table below summarizes the six options and shows the premium, reward (average net cost) and riskThe possibility that something bad will happen. (total cost if you have a large claim) metrics for each one. For each insurer, the premium and absolute value of your net cost decrease as the deductibleThe amount that you pay before the insurer starts reimbursing you either in part (see coinsurance) or in full. Deductibles can apply per claim (as is usually the case for auto collision and homeowners... More increases. The total cost if you have a large claim, though, increases as the deductibleThe amount that you pay before the insurer starts reimbursing you either in part (see coinsurance) or in full. Deductibles can apply per claim (as is usually the case for auto collision and homeowners... More increases. When converted to financial outflows, the total cost values get larger (less negative) as the deductibleThe amount that you pay before the insurer starts reimbursing you either in part (see coinsurance) or in full. Deductibles can apply per claim (as is usually the case for auto collision and homeowners... More goes up. For the $500 and $5,000 deductiblesThe amount that you pay before the insurer starts reimbursing you either in part (see coinsurance) or in full. Deductibles can apply per claim (as is usually the case for auto collision and homeowners... More, Insurer 1 has a better price. For the $1,000 deductibleThe amount that you pay before the insurer starts reimbursing you either in part (see coinsurance) or in full. Deductibles can apply per claim (as is usually the case for auto collision and homeowners... More, Insurer 2 has a better price. These relationships can also be seen in the scatter plot below. As with the scatter plot for the first example, points that are up and to the right are better than those that are down and to the left. In this case, the efficient frontierWhen evaluating different options, the set of points for which there are no other options that either have a higher return for the same amount of risk or less risk for the same return. connects the $500 and $5,000 deductibleThe amount that you pay before the insurer starts reimbursing you either in part (see coinsurance) or in full. Deductibles can apply per claim (as is usually the case for auto collision and homeowners... More options for Insurer 1 and the $1,000 deductibleThe amount that you pay before the insurer starts reimbursing you either in part (see coinsurance) or in full. Deductibles can apply per claim (as is usually the case for auto collision and homeowners... More option for Insurer 2. Your choice among the three points on the efficient frontierWhen evaluating different options, the set of points for which there are no other options that either have a higher return for the same amount of risk or less risk for the same return. is one of personal riskThe possibility that something bad will happen. preference and your financial situation. The $5,000 deductibleThe amount that you pay before the insurer starts reimbursing you either in part (see coinsurance) or in full. Deductibles can apply per claim (as is usually the case for auto collision and homeowners... More option is clearly the least expensive on average, but you would need to be willing and able to spend an extra $4,000 if you had a large claim, as compared to the $1,000 deductibleThe amount that you pay before the insurer starts reimbursing you either in part (see coinsurance) or in full. Deductibles can apply per claim (as is usually the case for auto collision and homeowners... More policy. If you don’t have $5,000 in savings available to cover your deductibleThe amount that you pay before the insurer starts reimbursing you either in part (see coinsurance) or in full. Deductibles can apply per claim (as is usually the case for auto collision and homeowners... More, that choice is not an option for you. When I look at this chart, I notice that there is a fairly large reduction in the net cost from Insurer 1’s $500 deductibleThe amount that you pay before the insurer starts reimbursing you either in part (see coinsurance) or in full. Deductibles can apply per claim (as is usually the case for auto collision and homeowners... More quote to Insurer 2’s $1,000 deductibleThe amount that you pay before the insurer starts reimbursing you either in part (see coinsurance) or in full. Deductibles can apply per claim (as is usually the case for auto collision and homeowners... More quote. If I have the extra $500 in savings to cover a loss if I have a claim, that looks like a good choice. 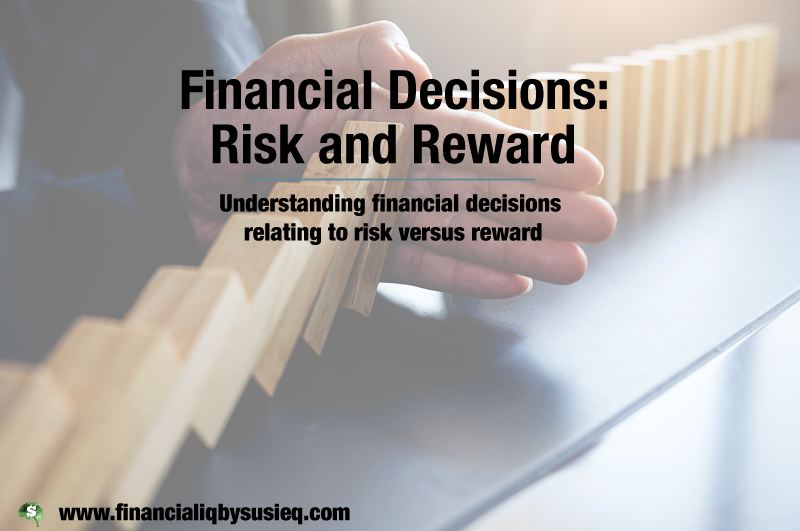 But, again, it is up to you to consider your finances and risk tolerancePersonal preference indicating how much risk you are willing to take to achieve a higher return.. The same type of analysis can be used to evaluate different investment options. As long as you are looking at publicly traded stocks, ETFs, mutual funds or one of several other financial instruments, you can get lots of data about historical returns from Yahoo Finance. It is important to remember to let the historical data INFORM your decision, as the past is not always a good predictor of the future when looking at financial returns. Here is how I use Yahoo Finance to get data. Find the Quote Lookup box. When I go to that site, it is usually on the right side of the screen below the scroller with the returns on various indices. Type the symbol for the financial instrumentAny investment that you purchase. Examples include an exchange-traded fund, a mutual fund, stock in an individual company, a bond and a money market fund. There are also many more complex financia... More for which I’m seeking data. Every publicly traded financial instrumentAny investment that you purchase. Examples include an exchange-traded fund, a mutual fund, stock in an individual company, a bond and a money market fund. There are also many more complex financia... More has a symbol. For example, Apple is AAPL and the S&P 500 is ^GSPC. I can also enter the name of the company or instrument, though it isn’t always the best at finding the one I want. If the lookup doesn’t work very well, I use Google for the symbol of the company or financial instrumentAny investment that you purchase. Examples include an exchange-traded fund, a mutual fund, stock in an individual company, a bond and a money market fund. There are also many more complex financia... More. Click on the Historical Data button just above the graph with the stock price. Select the time period over which you want the data in the pull-down box on the left. I usually want the full time series, so select Max. Select the frequency on the right. I tend to be a long-term investor, so I always select Monthly. Hit the Apply button just to the right of the frequency selection. Hit Download Data just below the Apply button. It will ask you the format in which you want the data. I always select Excel. You’ll get a spreadsheet with one tab with your data on it. There will be several columns in the spreadsheet that downloads from Yahoo Finance. I usually use the Date and Adjusted Close columns. Stocks can split (meaning you get more shares but they are worth less) and companies can issues dividends (which mean you get cash). If I just look at the closing price at the end of each month, it won’t reflect splits. Since I’m interested in total return, I want my data to reflect the benefit of dividends. The Adjusted Close column adjusts the closing stock price for both splits and dividends. A Nasdaq composite index fundA type of exchanged-traded fund (ETF) or mutual fund that invests in such a way that the returns on the fund are identical or very close to a market index. For example, an S&P 500 index fund wou... More – an exchange-traded fund or mutual fund that is intended to produce returns similar to the Nasdaq composite. Symbol on Yahoo Finance is ^IXIC. Fidelity investment grade bondA form of debt issued by government entities and corporations. fund – a Fidelity-managed mutual fund that invests in a basket of high-quality corporate bonds. Symbol on Yahoo Finance is FBNDX. Tweedy Browne Global Value Fund – a mutual fund that focuses on international stocks.Symbol is TBGVX. Boeing – A manufacturer of commercial and military aircraft. Boeing’s stock symbol is BA. Apple – No need to explain this one! Its stock symbol is AAPL. Neogen – A small company that develops and sells tests of food for pathogens. Stock symbol is NEOG. Here is a box and whisker plot of the risk of these seven options. See my previous post for a discussion of riskThe possibility that something bad will happen. and box and whisker plots. In addition to showing the 5th, 25th, 75thand 95thpercentiles, I added a blue horizontal line showing the average return over the 15-year time period for each investment. For most financial decisions, I look at the average result (e.g., average cost, average return, etc.) as my measure of reward. As illustrated in the first example, you can use any measure you want, including a subjective one like how much you will enjoy something. There are many, many riskThe possibility that something bad will happen. metrics from which to choose. If you are interested in overall volatilityThe possibility that something will deviate from its expected or average value, including both good and bad results. (deviations both up and down from the average), standard deviationA standard deviation is a (slightly messy) statistical calculation that results in a positive number that measures how much the possible results differ from the average result. For those of you who ... More is a good metric. The chart below show the scatter plot of these investments using the average return as the reward metric and standard deviationA standard deviation is a (slightly messy) statistical calculation that results in a positive number that measures how much the possible results differ from the average result. For those of you who ... More as the riskThe possibility that something bad will happen. metric. In this plot, points to the right are better because they represent higher reward. Points that are LOWER are also better, because they correspond to less riskThe possibility that something bad will happen.. I’ve drawn the efficient frontierWhen evaluating different options, the set of points for which there are no other options that either have a higher return for the same amount of risk or less risk for the same return. for these points as being the ones that are furthest to the right and lowest on the chart. Using these two metrics, the bondA form of debt issued by government entities and corporations. fund, Tweedy Browne (the international mutual fund), Boeing and Apple are on the efficient frontierWhen evaluating different options, the set of points for which there are no other options that either have a higher return for the same amount of risk or less risk for the same return.. If these metrics are right for you, the other investments are less than optimal. The choice among the investments on the efficient frontierWhen evaluating different options, the set of points for which there are no other options that either have a higher return for the same amount of risk or less risk for the same return. will be based on your willingness to tolerate extra volatilityThe possibility that something will deviate from its expected or average value, including both good and bad results. to achieve a higher average return. The scatter plot below shows how the location of the points changes if we replace standard deviationA standard deviation is a (slightly messy) statistical calculation that results in a positive number that measures how much the possible results differ from the average result. For those of you who ... More in the chart above with the probabilityA percentage or the equivalent fraction that falls between 0% and 100% (i.e., between 0 and 1) that represents the ratio of the number of times that the outcome meets some criteria to the number of po... More that the return will be less than zero in any one month. Using the probabilityA percentage or the equivalent fraction that falls between 0% and 100% (i.e., between 0 and 1) that represents the ratio of the number of times that the outcome meets some criteria to the number of po... More the return is less than zero causes the S&P 500 to be even worse relative to the efficient frontierWhen evaluating different options, the set of points for which there are no other options that either have a higher return for the same amount of risk or less risk for the same return. than it was when we used standard deviationA standard deviation is a (slightly messy) statistical calculation that results in a positive number that measures how much the possible results differ from the average result. For those of you who ... More. The change in metric also causes Neogen to move down onto the efficient frontierWhen evaluating different options, the set of points for which there are no other options that either have a higher return for the same amount of risk or less risk for the same return. and Boeing to move just slightly above it. These two charts show how our evaluation of the various options can change if we select different metrics. By changing the scale, I have made the differences in riskThe possibility that something bad will happen. look much smaller in the second chart than in the first chart. In my mind, the 31% probabilityA percentage or the equivalent fraction that falls between 0% and 100% (i.e., between 0 and 1) that represents the ratio of the number of times that the outcome meets some criteria to the number of po... More that the monthly return will fall below 0% of the BondA form of debt issued by government entities and corporations. Fund is significantly less than the 42% probabilityA percentage or the equivalent fraction that falls between 0% and 100% (i.e., between 0 and 1) that represents the ratio of the number of times that the outcome meets some criteria to the number of po... More for Apple. The second chart makes it look almost trivial. As you are looking at graphs in any context, you’ll want to be alert for that type of nuance. The goal of this post was to help improve financial decision-making process by providing insights into a helpful framework. While you may not create graphs such as the ones in this post, you will be better able to think about riskThe possibility that something bad will happen., what features of riskThe possibility that something bad will happen. are important to you and how to balance it with reward. These new tools will help you make better financial decisions. You made some first rate factors there. I appeared on the web for the issue and found most people will go along with together with your website. We greatly appreciate that you will share our blog with others. Hey very nice site!! Man .. Beautiful .. Amazing .. I’ll bookmark your site and take the feeds also…I’m happy to find so many useful information here in the post, we need develop more strategies in this regard, thanks for sharing. . . . . . This is great, I love having graphs and numbers explained like you did! During my economic studies we only even looked at the math without making it visible with examples of graphs, so this is really like a breath of fresh air!